Nepal is a paradise for the adventure sports. White water rafting, bungy, kayaking, cannoning, and paragliding is few examples of adventure sports available in Nepal. Paragliding is the adventure sport which is done either alone or with the help of paragliding guides. 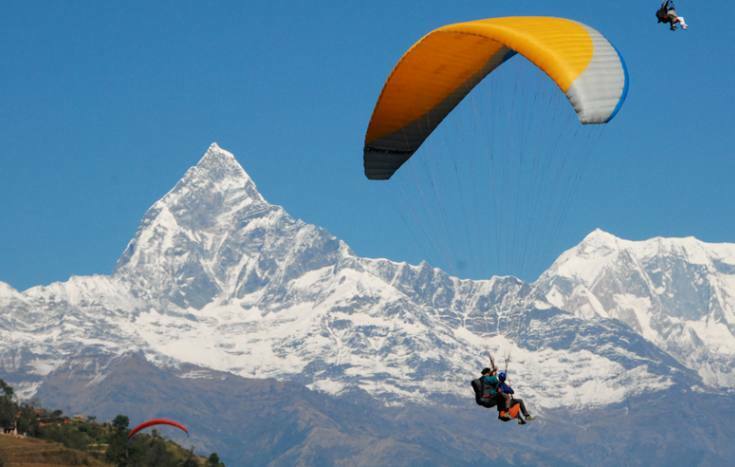 The Sarangkot hill of Pokhara, Bhedetaar of Dharan and in some parts of Kathmandu, Nuwakot and Gorkha the paragliding can be done. Witness the amazing picturesque bird eye view of naturally and culturally Nepal. Backpacker team would arrange your paragliding dream. The city seeing and other adventure sports like rafting, bungy and kayaking can be arranged in your itinerary along with the paragliding. Day 01Arrival Kathmandu & transfer to hotel. Day 02Flight to Pokhara from Kathmandu - O/N at hotel. Day 03Hiking to Sarangkot (1590m) - O/N at hotel. Day 04Paragliding tour - O/N at hotel in Pokhara. Day 05Sightseeing in Pokhara city.